Obviously not all loudspeakers can be placed wherever the user wants due to space constraints or the inflexibility of interior design schemes. Typical freestanding loudspeakers can suffer from unwanted 'boundary effects' when wall-mounted, which leads to 'bass coloration' and an unnatural midrange response. Conversely, loudspeakers designed specifically for wall mounting can sound 'thin' and 'lightweight' when positioned in free space. KEF's innovative Selecta-mount system uses a clever internal connecting system to automatically adjust the crossover depending on how the loudspeaker is mounted, gives you the freedom to place the loudspeakers wherever you want and still enjoy great sound. The sound of a loudspeaker will vary according to where it is located relative to the boundaries of a room. When a loudspeaker is moved from a free space position to being mounted on a wall the sound at the listening position is significantly altered. Sound, which would otherwise diffract to the rear of the speaker, is immediately reflected forwards, causing interference with the direct output from the drivers. Wall mounting a loudspeaker produces the familiar 'comb filtering' effect - alternating constructive and destructive interference with the direct signal depending on the phase difference between direct and wall-reflected components. Below 200Hz output is increased up to maximum of just under 6dB. At around 400Hz the wall reflection is out of phase with the direct signal and a dip in response results. At around 650Hz the path length difference is equal to a full wavelength, so we see a peak in the response. 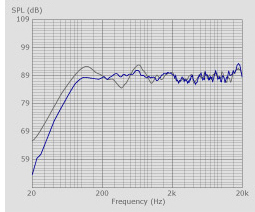 Acoustic response of the KEF KHT9000 measured at 1m in free space (blue curve) and on-wall (grey). Additional filter elements are included into the 'Selecta-mount' crossover network of the speaker to compensate for the response change when the speaker is wall mounted. The response lift from 80 to 200Hz is the main effect that is corrected in all 'Selecta-mount' systems, and in the KHT9000 the peak at 650Hz is also corrected. The response lift below 80Hz is left in as it gives extra bass extension without affecting driver excursion. The dip at 400Hz remains, as this is rather complicated to correct in a convenient, switch-able way. Acoustic response of the KEF KHT9000 measured at 1m in free space (blue curve) and on-wall (grey curve) with the wall filter in circuit. In the Selecta-mount systems the wall filter is automatically engaged when the speaker is mounted onto its wall bracket. When fitted onto the regular stand the wall filter is bypassed. The customer is not required to do any switching.